700-Year-Old Mummy Found 2 Meters Below the Surface of the Road... UNBELIEVABLE! Ancient Egyptians believed in an afterlife when someone died. Mummification helped someone reach the afterlife as they thought that, in order to have an afterlife, the dead person would have to repossess his or her body. But there is one thing that shocked everyone in Tanzou City in the Province of China, After These Chinese Road workers dug up a mysterious box on the surface of the road. What everyone was surprised about is that the mysterious wooden box is actually a coffin containing a 700-year-old Mummy which indeed in a good condition. 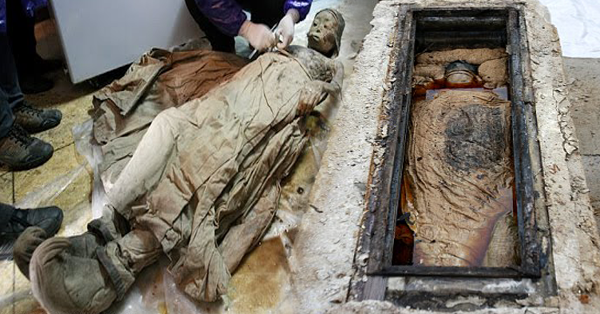 Chinese Archaeologists said that the mummy was a high-ranking woman during the Ming Dynasty. Specialists claimed that the brown liquid which surrounds the Mummy did a great contribution on preserving this 700-year-old body.